Too much soda can rob your body of the potassium it needs to function normally. Potassium plays a crucial role in muscle contraction, including your heart and digestive tract. A lower-than-normal level of potassium is called hypokalemia. A small drop in potassium can be asymptomatic, while a bid drop can be fatal. In most cases, taking potassium supplements as prescribed by your doctor can correct hypokalemia, explains the University of Maryland Medical Center. A 52-year-old man developed hypokalemia from drinking too much soda, according to a case study from the Louis Stokes Cleveland Veterans Affairs Medical Center and published in the July 2008 issue of "Cases Journal." He drank 4 liters of cola per day, which contained 396 grams of fructose. Too much fructose causes hypokalemia due to potassium lost through diarrhea and gastrointestinal potassium wasting. Researchers note the cola frequently provided the bulk of his daily caloric intake. Drinking 4 liters of soda per day only provides 169 milligrams of potassium, but adults need about 4.7 grams of potassium per day. Caffeine intoxication from drinking too much soda and tea played a major role in one case of hypokalemia, according to information from Shinoda General Hospital in Japan and reported in the June 2010 issue of the journal "Internal Medicine." The 30-year-old man in the case study drank 1.5 to 2.5 liters of cola, along with 1.5 to 3.0 liters of oolong black tea per day. The two beverages contained a combined total of 960 to 1,760 milligrams of caffeine daily. His baseline serum potassium level was 4.3 mmol/dL, and within two months of drinking the caffeinated beverages it fell to 2.3 mmol/dL. Drinking too much cola-based sodas can cause hypokalemia, but this rarely happens, according to a review of existing scientific information from the University of Ioannina in Greece and published in the June 2009 edition of the "International Journal of Clinical Practice." However, the researchers uncovered "several lines of evidence" to suggest a link between drinking too much cola and a reduction in potassium levels. Drinking too much cola can cause hypokalemia, resulting in a variety of muscle problems, according to the same study from the University of Ioannina. 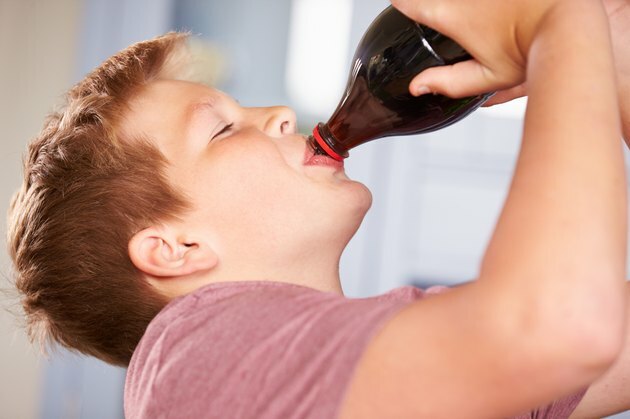 Researchers examined cases with patients consuming between 2 to 9 liters of cola per day. The patients experienced muscle problems ranging from fatigue and increasing muscular weakness to temporary paralysis. Researchers warn sodas with or without caffeine have the potential to cause a drastic drop in your serum potassium levels.